Less than a year after being enshrined as the opening day starting running back, Daryl Richardson has been giving his walking papers by the St. Louis Rams. 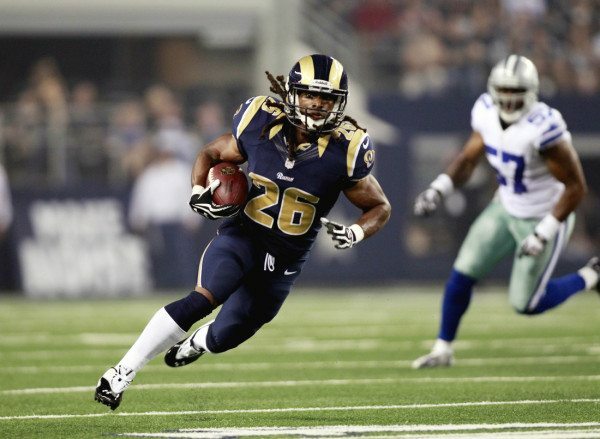 In a day of low profile cuts, the Rams have decided to cut ties with Richardson, who was made expendable after the Rams drafted former Auburn running back Tre Mason. As a rookie, the former seventh-round selection showed flashes of brilliance as a change of pace behind Steven Jackson, averaging 4.8 yards a carry and appeared to be the silver platter of late-round value. Richardson competed and was eventually entrenched in the lead role his sophomore season once Jackson walked in free agency. Richardson however was unimpressive once the regular season kicked off and was center of criticism for the Rams’ lackluster running game. After Zac Stacy was supplanted in the starting role, Richardson was slowly phased out of the offense and wasn’t given any favors by lingering injuries down the stretch. It was clear a running back was about to walk the plank, but Richardson is an intriguing move. He’s proved to be far more valuable than 2012 second-round pick Isiah Pead who has racked up 17 career carries and a substance abuse suspension. It’s also noteworthy that Pead was apparently the subject of trade talks during the draft. The Rams still have tough decisions to make regarding their crowded stable of running backs, which could be something worth paying attention to this summer. Tigers Rebound with Convincing Win!